Welcome to the Petrified Forest National Park Information Page. The closest airports are located at Flagstaff and Phoenix, Arizona and Albuquerque, New Mexico. 1. Take Highway 89 South to I-40 East to the park. 2. Take Highway 666 South to I-40 West to the park. 1. Take I-40 West to the park. 1. Take Highway 180 North to the park. 1. Take I-40 East to the park. Bus service is not available. Private vehicle or commercial tours only. About one half of the visitation occurs during June, July and August. The visitation for 1996 was 829,615. Visitation for 1999 was 666,978. Sites throughout the park tell of human history in the area for more than 2,000 years. We don’t know the entire story, but there were separate occupations, a cultural transition from wandering families to settled agricultural villages, pueblos, and trading ties with neighboring villages. Then this story of early people, told by potsherds, rubble, and pictures on the rocks, fades around 1400 AD. In the mid-1800’s US Army mappers and surveyors came into this area and carried back East stories of the remarkable “Painted Desert and its trees turned to stone.” Next, farmers, ranchers, and sightseers made their ways into the area. After a period of using the wood for souvenirs and numerous commercial ventures, territorial residents recognized that the supply of petrified wood was not endless. 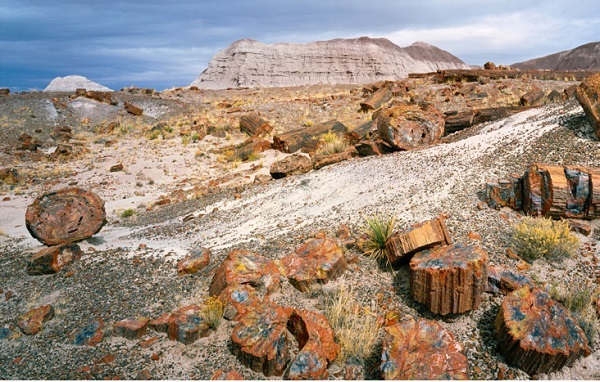 In 1906 selected “forests” were set aside as Petrified Forest National Monument. In 1932 some 1,000 hectares (2,500 acres) more of the Painted Desert were purchased and added to the monument. In 1962 the area became Petrified Forest National Park, and in 1970, 20,250 hectares (50,000 acres) were further set aside as wilderness. All major facilities, including concessions are accessible. Portions of some trails are accessible (Giant Logs, Puerco Pueblo). Petrified Forest is a surprising land of scenic wonders and fascinating science. The park is located in northeast Arizona and features one of the world’s largest and most colorful concentrations of petrified wood. Also included in the park’s 93,533 acres are the multi-hued badlands of the Painted Desert, archeological sites and displays of 225 million year old fossils. There are no campgrounds in the park but they are available in nearby communities. Overnight backpacking is allowed in the Painted Desert wilderness. A permit is required and can be obtained for free at the visitor center or museum. Avoid sick or dead animals and rodent nests or borrows. Do not approach any park animal. Teach children to avoid dead animals and rodent nests or burrows. Do not allow dogs and cats to roam free; minimize or prevent their interaction with wild animals. Be sure to immunize your pets. Dust dogs and cats with insecticide powder to prevent transportation of fleas into homes or vehicles. Use insect repellent on clothes. Reduce and eliminate rodent populations in and around homes and other buildings. Anyone handling dead animals must wear gloves). Cats are very susceptible to plague and rabies. Be cautious when handling sick cats with possible exposure. See a doctor immediately if exposed to any of these potentially fatal diseases. For more information, contact your local health department. At the north end of the park is the Cougar Cafe and a gas station that features a travel store. The Rainbow Forest Curio Shop, at the south end of the park, has packaged foods and a snack bar. Petrified Forest National Park backcountry includes 50,260 acres of established wilderness. Day hikes are the most popular way to explore the backcountry. Many features can be reached in one day trip, most lying within a few miles of the park road. There are no developed trails in Petrified Forest wilderness, so most hiking is cross country style. Clear air, a lack of heavy vegetation, and a variety of landmarks combine to make conditions excellent for this type of hike. Since water and shade are not available, hikers should carry their own. A wide brimmed hat and long sleeve shirt will provide good sun protection. A gallon of water per person per day is recommended in summer months. Good sturdy shoes will make hiking in the park’s loose sand and loose clay more comfortable. Topographic maps and more detailed information are recommended for hikers planning extended trips. Just park in any designated pullout in the park and you can be on your way to a deeper understanding of Petrified Forest. The entire park boundary is fenced and most of the surrounding land is privately owned. Please get permission from landowners before hiking on their lands. There are no lodging facilities or campgrounds in the park but they are available in nearby communities. Pets: Leaving your pet in a parked car can be a deadly mistake. On a warm day, the temperature in a parked car can reach 160 degrees in a matter of minutes, even with partially opened windows. Breathing this hot air, your pet can quickly suffer brain damage or die from heatstroke. Signs of heat stress are: heavy panting, glazed eyes, rapid pulse, dizziness, vomiting, deep red or purple tongue. Placing your pet in shade and applying cool (not cold) water all over its body. Applying ice packs or cold towels only to head, neck and chest. Letting it drink small amounts of cool water, or lick ice cubes or ice cream. Immediately taking your pet to a veterinarian. A free permit must be obtained for overnight wilderness camping. Permits are available at the Painted Desert Visitor Center or the Rainbow Forest Museum. Commercial photography requires a permit and it must be obtained well in advance or your visit. High Elevations: Visitors unaccustomed to high elevations may experience mild symptoms of high altitude sickness. These include nausea, dizziness, headache, rapid heartbeat, and shortness of breath. Minimize these effects by increasing fluid intake, avoiding alcohol and cigarettes, eating lightly and frequently and getting plenty of rest. Ultraviolet radiation is also a threat at high elevations. Wear sunglasses with ultraviolet protection, a hat, long-sleeved garments, and use sunscreen to prevent sunburn. Keep Wildlife Wild: Never feed wildlife. By luring wildlife into traffic areas they are frequently hit by cars. Wildlife can become dependent on human food, and even lose the ability to hunt. Wildlife carry diseases such as rabies, hantavirus or bubonic plague that can be transmitted to humans. Photograph all wildlife from the safety of your vehicle or from the roadside. Observe wildlife quietly; approaching them frightens them away. Watch Your Step: Many accidents happen when people fall by stepping off trails or roadsides, or by venturing onto steep slopes. Stay on designated trails and don’t go beyond protective fencing or guardrails. Supervise children closely in such areas. Lightening: Afternoon thunder and lightning storms are frequent during summer. Thunder, darkening clouds and changes in wind velocity and direction are indicators of an approaching storm. Avoid high observation areas, open areas, and rocky overhangs during thunderstorms. If you are caught in the open, squat with your hands on your knees, keep your head low, and wait for the storm to pass. Hiking and Backcountry Travel: Be prepared for all types of weather. Unforeseen conditions can change a short hike into an unpleasant adventure. Severe storms can impose wilderness hazards even a short distance from your car. Do not attempt to cross water filled washes. Always carry protective clothing even when the weather does not appear threatening. Painted Desert Visitor Center (north end) has a 20 minute Orientation film. Painted Desert Inn NHL – has exhibits, bookstore and expansive view of the Painted Desert. Rainbow Forest Museum (south end) has exhibits of petrified wood and of the area’s geological story and human history. Summers are generally hot with temperatures in the 90’s and occasionally in the low 100’s. In winter the highs in the 40’s or 50’s, or much colder with highs only in the 20’s. Annual rainfall is 9 to 10 inches with 40% occurring as thunderstorms in the late summer. There is occasional snow in the winter. High winds can happen any time of year. Humidity is usually low.